Just as the "Bat" at the old Yankee Stadium was a gathering point for fans, so too, is the "Eagle" at Hicksville's Long Island Railroad Station. "It's a local icon," said Richard Althaus of the Hicksville Historical Society. "Everyone says, let's meet at the Eagle. Everyone knows the Eagle." But while thousands of commuters pass the "Eagle" every day, not everyone realizes its historical significance. "I see it when I come here it but I never stopped to look at it," said a sheepish commuter Janelle Elder of Jamaica. Forty five years after its arrival in Hicksville, the Eagle is a forgotten landmark and it looks the part. Its marble is dark and dirty. Its beak has broken off. But this stone bird has been around. Its original home was atop the old Pennsylvania Station in Manhattan, which opened in 1910. There were 13 other Eagles just like it, adorning what LIRR historian David Morrison called "one of the most beautiful buildings ever built." When Penn Station was demolished in the mid-1960's, Morrison said, the Eagles were earmarked for local landfills. But all were rescued, including the one in Hicksville, which was moved there after a high school Latin teacher and his class lobbied to place it outside their local train station. It was welcomed in a grand ceremony, in which the students dressed in Roman togas. But, after that, the Eagle fell into disrepair. "People just neglect all kinds of art," said Althaus. "It's a shame." 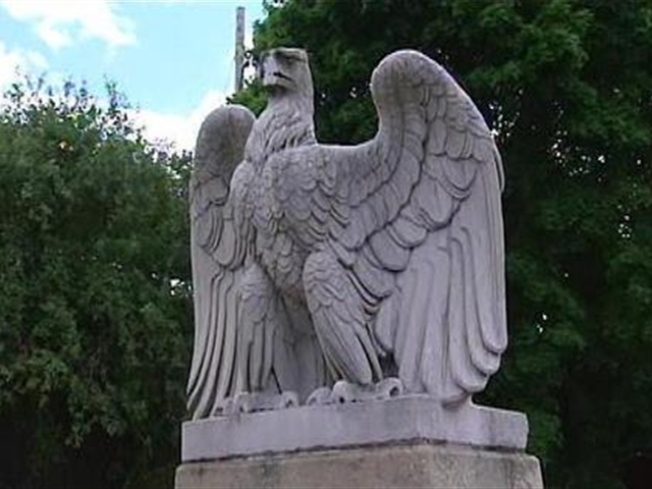 Local civic leader Joel Berson has spearheaded a fundraising effort to pay for the restoration of the Eagle and with cash from Nassau County's hotel/motel tax fund, Berson and his supporters have raised the five thousand dollars needed to hire a Manhattan sculptor to refurbish the Eagle. "It's just an important artifact worthy of restoration," said Nassau County Executive Edward Mangano. The project should be completed by year's end, leaving the Eagle ready to soar again. "It's priceless," said Morrison, who noted that one remaining Eagle is now in Washington, DC's Smithsonian Institution, with two others now standing outside the current Penn Station.